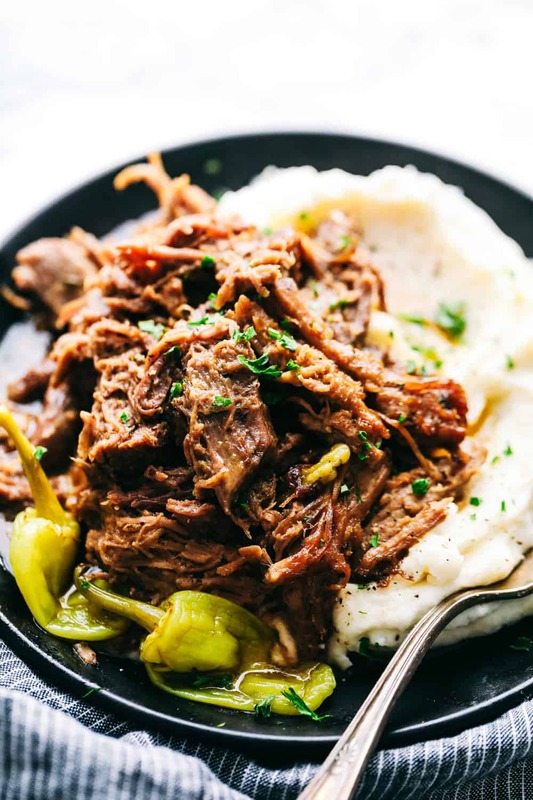 Slow Cooker Mississippi Pork Roast is a savory, sweet and spicy pork roast that is tender to the touch and falls apart with ease. It takes minutes to prepare and can be paired with a variety of sides. Your family will fall in love with this incredibly flavorful, melt in your mouth pork roast! I have fallen in love with this Smithfield Homestyle Fresh Pork Roast. It is tender, juicy and has all the flavor you need. It is so convenient and pre-seasoned which is why it is my go-to for creating an easy and incredible meal for my family. It turned out perfect in the slow cooker and I am here to tell you, it was one of the best meals that I have ever made. Since making this recipe a couple of weeks ago, I have already made it again twice. I keep asking everyone that I come in contact with if they have had Mississippi pork roast. How have I lived so long without trying it? This hands down had the best flavor and our family couldn’t eat it fast enough. One of the best parts about this meal is that it is so incredibly easy. It takes less than 5 minutes to put everything in the slow cooker and within minutes it is ready for dinner. This tender, melt in your mouth pork has flavor that is to die for. Mississippi Roast usually calls for beef roast, but I love that you can always swap it out for pork. My entire family ate this meal and loved it. It was such a winner in our book and the reason why I keep making it again and again! This meal is so versatile and can be served in so many different ways. We first loved it with a side of mashed potatoes, but throughout the week with the little bit of left overs that we had, I was able to create a few more outstanding recipes. You can use the pork roast on top of nachos, in a sandwich, or in tacos. There are so many uses for this recipe that you are going to love. Simplify your life by using Marinated Fresh Pork. It comes in a wide assortment of mouthwatering flavors including; Roasted Garlic and Herb, Applewood Smoked Bacon, Sweet Teriyaki and Slow Smoked Mesquite. It also comes in a wide variety of cuts including; loin filets, chops, ribs, sirloins, and tenderloins. For more product information and recipe inspiration visit Smithfield.com. What is in Mississippi Pork Roast? 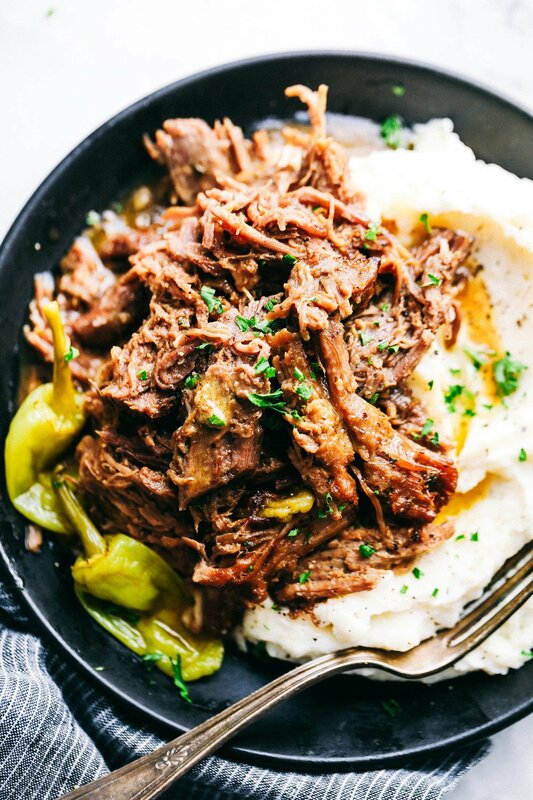 How do you make Slow Cooker Mississippi Pork Roast? 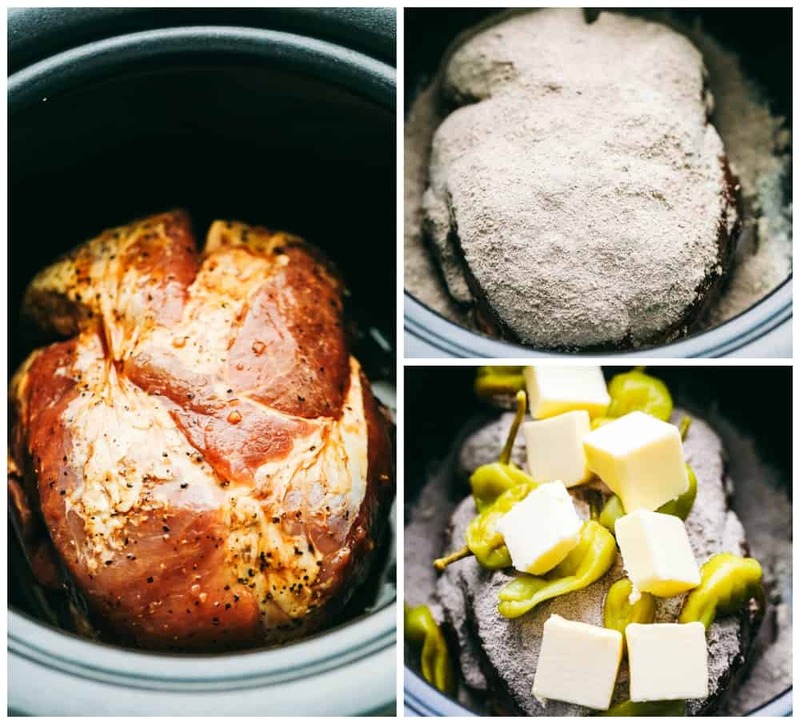 Add pork roast to slow cooker. Sprinkle ranch and au jus packages on top. Top with stick of butter and peppers. Cook on low 6 hours. Shred with fork and serve. What is the proper temperature for pork roast? The National Pork Board recommends cooking pork chops, roasts, and tenderloins to an internal temperature between 145° Fahrenheit (medium rare) and 160° Fahrenheit (medium), followed by a 3 minute rest. Since large cuts increase approximately 10° Fahrenheit while resting, remove them from the heat at 150° Fahrenheit followed by a 10 minute rest. What are some ideas to make with Mississippi Pork Roast? 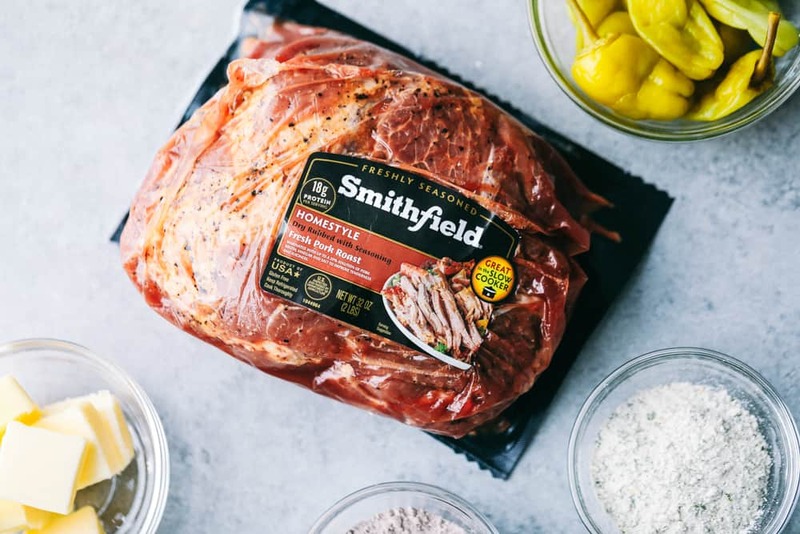 Smithfield is available at select grocery stores nationwide, including ShopRite, Food Lion, Publix, Albertsons/Safeway, Save a Lot, and Walmart. 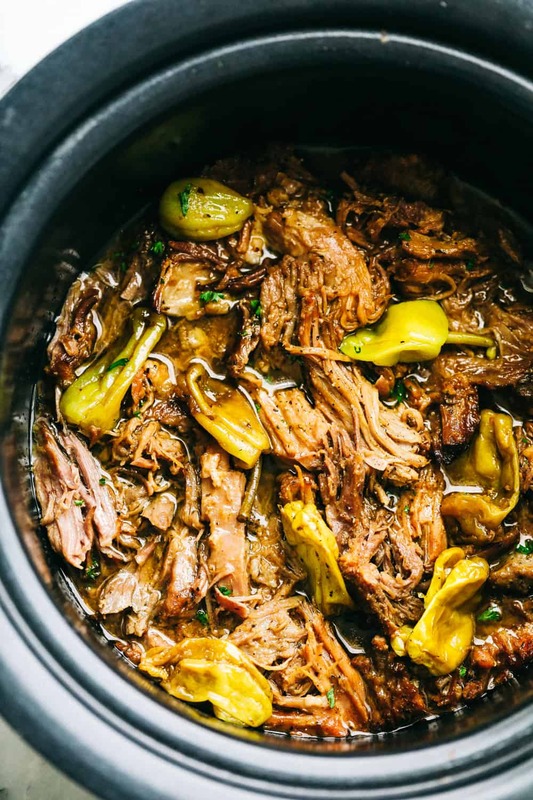 Slow Cooker Mississippi Pork Roast is a savory, sweet and spicy pork roast that is tender to the touch and falls apart with ease. 1. Add pork roast to slow cooker. Sprinkle ranch and au jus packages on top. Top with stick of butter and peppers. 2. Cook on low 6 hours. 3. Shred with fork and serve. *If you are not a fan of peppers, you do not have to eat them, but they are great to add flavor during the cooking process. so which is it? a stick? or half a stick? I make this with beef, and never thought to try it with pork, so I am looking forward to checking it out. We love this recipe (makes great french dip sandwiches with the leftovers), but I do find it tends to be a little salty. I use the low-sodium version of the Au Jus packet, and googled a recipe for homemade dry ranch seasoning so that I could control the salt a little better. I also found a jar of sliced pepperoncinis, so I use that instead of the whole ones – they just melt right into the sauce! At the end, I add a little cornstarch slurry to thicken the gravy. I’m sure it’s because I used a larger roast (about 2.5 lbs), but it was not that close to done after about 5.5 hours. However I just jacked the heat to high and after an hour and a half, it was pretty much perfect. Tasted great, too. What if I can’t find a marinated pork roast? Can I use one that is not marinated? Should I add something to the pork if it’s not marinated? Thanks! I would recommend finding this marinated pork roast. It seriously will change your life.